This article is about the mental process. For the journal, see Cognition (journal). "Cognitive" redirects here. For other uses, see Cognitive (disambiguation). The word cognition comes from the Latin verb cognosco (con, 'with', and gnōscō, 'know'; itself a cognate of the Greek verb γι(γ)νώσκω, gi(g)nόsko, meaning 'I know, perceive'), meaning 'to conceptualize' or 'to recognize'. The word cognition dates back to the 15th century, when it meant "thinking and awareness". Attention to cognitive processes came about more than eighteen centuries earlier, however, beginning with Aristotle (384–322 BC) and his interest in the inner workings of the mind and how they affect the human experience. Aristotle focused on cognitive areas pertaining to memory, perception, and mental imagery. He placed great importance on ensuring that his studies were based on empirical evidence, that is, scientific information that is gathered through observation and conscientious experimentation. Two millennia later, as psychology emerged as a burgeoning field of study in Europe and then gained a following in America, other scientists like Wilhelm Wundt, Herman Ebbinghaus, Mary Whiton Calkins, and William James would offer their contributions to the study of human cognition. Wilhelm Wundt (1832–1920) emphasized the notion of what he called introspection: examining the inner feelings of an individual. With introspection, the subject had to be careful to describe his or her feelings in the most objective manner possible in order for Wundt to find the information scientific. Though Wundt's contributions are by no means minimal, modern psychologists find his methods to be quite subjective and choose to rely on more objective procedures of experimentation to make conclusions about the human cognitive process. Mary Whiton Calkins (1863–1930) was an influential American pioneer in the realm of psychology. Her work also focused on the human memory capacity. A common theory, called the recency effect, can be attributed to the studies that she conducted. The recency effect, also discussed in the subsequent experiment section, is the tendency for individuals to be able to accurately recollect the final items presented in a sequence of stimuli. Calkin's theory is closely related to the aforementioned study and conclusion of the memory experiments conducted by Hermann Ebbinghaus. William James (1842–1910) is another pivotal figure in the history of cognitive science. James was quite discontent with Wundt's emphasis on introspection and Ebbinghaus' use of nonsense stimuli. He instead chose to focus on the human learning experience in everyday life and its importance to the study of cognition. James' most significant contribution to the study and theory of cognition was his textbook Principles of Psychology that preliminarily examines aspects of cognition such as perception, memory, reasoning, and attention. 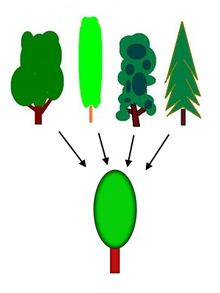 When the mind makes a generalization such as the concept of tree, it extracts similarities from numerous examples; the simplification enables higher-level thinking (abstract thinking). In psychology, the term "cognition" is usually used within an information processing view of an individual's psychological functions (see cognitivism), and it is the same in cognitive engineering; in a branch of social psychology called social cognition, the term is used to explain attitudes, attribution, and group dynamics. Human cognition is conscious and unconscious, concrete or abstract, as well as intuitive (like knowledge of a language) and conceptual (like a model of a language). It encompasses processes such as memory, association, concept formation, pattern recognition, language, attention, perception, action, problem solving and mental imagery. Traditionally, emotion was not thought of as a cognitive process, but now much research is being undertaken to examine the cognitive psychology of emotion; research is also focused on one's awareness of one's own strategies and methods of cognition, which is called metacognition. While few people would deny that cognitive processes are a function of the brain, a cognitive theory will not necessarily make reference to the brain or to biological processes (compare neurocognitive). It may purely describe behavior in terms of information flow or function. Relatively recent fields of study such as neuropsychology aim to bridge this gap, using cognitive paradigms to understand how the brain implements the information-processing functions (see also cognitive neuroscience), or to understand how pure information-processing systems (e.g., computers) can simulate human cognition (see also artificial intelligence). The branch of psychology that studies brain injury to infer normal cognitive function is called cognitive neuropsychology. The links of cognition to evolutionary demands are studied through the investigation of animal cognition. The serial position experiment is meant to test a theory of memory that states that when information is given in a serial manner, we tend to remember information in the beginning of the sequence, called the primacy effect, and information in the end of the sequence, called the recency effect. Consequently, information given in the middle of the sequence is typically forgotten, or not recalled as easily. This study predicts that the recency effect is stronger than the primacy effect, because the information that is most recently learned is still in working memory when asked to be recalled. Information that is learned first still has to go through a retrieval process. This experiment focuses on human memory processes. During the memory span experiment, each subject is presented with a sequence of stimuli of the same kind; words depicting objects, numbers, letters that sound similar, and letters that sound dissimilar. After being presented with the stimuli, the subject is asked to recall the sequence of stimuli that they were given in the exact order in which it was given. In one particular version of the experiment, if the subject recalled a list correctly, the list length was increased by one for that type of material, and vice versa if it was recalled incorrectly. The theory is that people have a memory span of about seven items for numbers, the same for letters that sound dissimilar and short words. The memory span is projected to be shorter with letters that sound similar and with longer words. In one version of the visual search experiment, a participant is presented with a window that displays circles and squares scattered across it. The participant is to identify whether there is a green circle on the window. In the "featured" search, the subject is presented with several trial windows that have blue squares or circles and one green circle or no green circle in it at all. In the "conjunctive" search, the subject is presented with trial windows that have blue circles or green squares and a present or absent green circle whose presence the participant is asked to identify. What is expected is that in the feature searches, reaction time, that is the time it takes for a participant to identify whether a green circle is present or not, should not change as the number of distractors increases. Conjunctive searches where the target is absent should have a longer reaction time than the conjunctive searches where the target is present. The theory is that in feature searches, it is easy to spot the target, or if it is absent, because of the difference in color between the target and the distractors. In conjunctive searches where the target is absent, reaction time increases because the subject has to look at each shape to determine whether it is the target or not because some of the distractors if not all of them, are the same color as the target stimuli. Conjunctive searches where the target is present take less time because if the target is found, the search between each shape stops. The semantic network of knowledge representation systems has been studied in various paradigms. One of the oldest paradigms is the leveling and sharpening of stories as they are repeated from memory studied by Bartlett. The semantic differential used factor analysis to determine the main meanings of words, finding that value or "goodness" of words is the first factor. More controlled experiments examine the categorical relationships of words in free recall. The hierarchical structure of words has been explicitly mapped in George Miller's Wordnet. More dynamic models of semantic networks have been created and tested with neural network experiments based on computational systems such as latent semantic analysis (LSA), Bayesian analysis, and multidimensional factor analysis. The semantics (meaning) of words is studied by all the disciplines of cognitive science. An emergent field of research, referred to as "Team Cognition", is arising in military sciences. "Team cognition" indicates “an emergent property of teams that results from the interplay of individual cognition and team process behaviors [...] [Team cognition] underlies team performance” (Arizona State University East, 2005, Cooke NJ, 2005). Metacognition is "cognition about cognition", "thinking about thinking", "knowing about knowing", becoming "aware of one's awareness" and higher-order thinking skills. The term comes from the root word meta, meaning "beyond", or "on top of". Metacognition can take many forms; it includes knowledge about when and how to use particular strategies for learning or problem-solving. There are generally two components of metacognition: (1) knowledge about cognition and (2) regulation of cognition. Metamemory, defined as knowing about memory and mnemonic strategies, is an especially important form of metacognition. Academic research on metacognitive processing across cultures is in the early stages, but there are indications that further work may provide better outcomes in cross-cultural learning between teachers and students. Some evolutionary psychologists hypothesize that humans use metacognition as a survival tool. [need quotation to verify] Writings on metacognition date back at least as far as two works by the Greek philosopher Aristotle (384-322 BC): On the Soul and the Parva Naturalia. ^ "cognition - definition of cognition in English from the Oxford dictionary". www.oxforddictionaries.com. Retrieved 2016-02-04. ^ Von Eckardt, Barbara (1996). What is cognitive science?. Massachusetts: MIT Press. pp. 45–72. ISBN 9780262720236. ^ Stefano Franchi, Francesco Bianchini. "On The Historical Dynamics Of Cognitive Science: A View From The Periphery". The Search for a Theory of Cognition: Early Mechanisms and New Ideas. Rodopi, 2011. p. XIV. ^ Matlin, Margaret (2009). Cognition. Hoboken, NJ: John Wiley & Sons, Inc. p. 4. ^ a b Fuchs, A. H.; Milar, K.J. (2003). "Psychology as a science". Handbook of Psychology. 1 (The history of psychology): 1–26. doi:10.1002/0471264385.wei0101. ^ Zangwill, O. L. (2004). The Oxford companion to the mind. New York: Oxford University Press. pp. 951–952. ^ Zangwill, O.L. (2004). The Oxford companion to the mind. New York: Oxford University Press. p. 276. ^ Madigan, S.; O'Hara, R. (1992). "Short-term memory at the turn of the century: Mary Whiton Calkin's memory research". American Psychologist. 47 (2): 170–174. doi:10.1037/0003-066X.47.2.170. ^ a b Matlin, Margaret (2009). Cognition. Hoboken, NJ: John Wiley & Sons, Inc. p. 5. ^ a b Sternberg, R. J., & Sternberg, K. (2009). Cognitive psychology (6th Ed.). Belmont, CA: Wadsworth, Cengage Learning. ^ Blomberg, O. (2011). "Concepts of cognition for cognitive engineering". International Journal of Aviation Psychology. 21 (1): 85–104. doi:10.1080/10508414.2011.537561. ^ Cherry, Kendra. "Jean Piaget Biography". The New York Times Company. Retrieved 18 September 2012. ^ Surprenant, A (2001). "Distinctiveness and serial position effects in total sequences". Perception and Psychophysics. 63 (4): 737–745. doi:10.3758/BF03194434. PMID 11436742. ^ Krueger, L. (1992). "The word-superiority effect and phonological recoding". Memory & Cognition. 20 (6): 685–694. doi:10.3758/BF03202718. ^ Nairne, J.; Whiteman, H.; Kelley, M. (1999). "Short-term forgetting of order under conditions of reduced interference" (PDF). Quarterly Journal of Experimental Psychology A: Human Experimental Psychology. 52: 241–251. doi:10.1080/713755806. ^ May, C.; Hasher, L.; Kane, M. (1999). "The role of interference in memory span". Memory & Cognition. 27 (5): 759–767. doi:10.3758/BF03198529. PMID 10540805. ^ Wolfe, J.; Cave, K.; Franzel, S. (1989). "Guided search: An alternative to the feature integration model for visual search". Journal of Experimental Psychology: Human Perception and Performance. 15 (3): 419–433. CiteSeerX 10.1.1.551.1667. doi:10.1037/0096-1523.15.3.419. ^ Russo, M.; Fiedler, E.; Thomas, M.; McGhee (2005), United States Army Aeromedical Research Laboratory. Cognitive Performance in Operational Environments, North Atlantic Treaty Organization (NATO) RTO-MP-HFM-124, 14 - 3 - Open access material, PUBLIC RELEASE - ISBN 92-837-0044-9 - “Strategies to Maintain Combat Readiness during Extended Deployments – A Human Systems Approach”. ^ a b Metcalfe, J., & Shimamura, A. P. (1994). Metacognition: knowing about knowing. Cambridge, MA: MIT Press. ^ Schraw, Gregory (1998). "Promoting general metacognitive awareness". Instructional Science. 26: 113–125. doi:10.1023/A:1003044231033. ^ Dunlosky, J. & Bjork, R. A. (Eds.). Handbook of Metamemory and Memory. Psychology Press: New York. ^ Colman, Andrew M. (2001). "metacognition". A Dictionary of Psychology. Oxford Paperback Reference (4 ed.). Oxford: Oxford University Press (published 2015). p. 456. ISBN 9780199657681. Retrieved 2017-05-17. Writings on metacognition can be traced back at least as far as De Anima and the Parva Naturalia of the Greek philosopher Aristotle (384-322 BC) [...]. Ardila, Alfredo (2018). Historical Development of Human Cognition. A Cultural-Historical Neuropsychological Perspective. Springer. ISBN 978-9811068867. Coren, Stanley; Lawrence M. Ward; James T. Enns (1999). Sensation and Perception. Harcourt Brace. p. 9. ISBN 978-0-470-00226-1. This page was last edited on 22 April 2019, at 05:53 (UTC).